Brief：It will be easier for Chinese business people and tourists to get visas to invest and travel to the US for business and leisure. The US ambassador to China said his top priority is to support President Barack Obama's job-creating efforts by two means: increasing Chinese investment in the United States and expanding American exports. 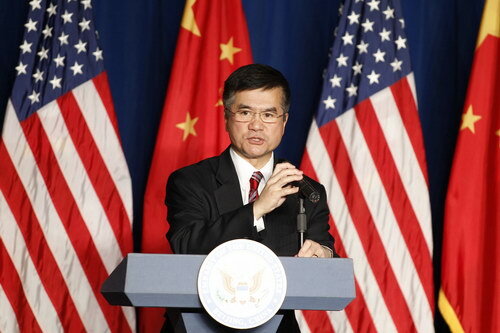 The US will make many products easier to export to China and other countries by no longer requiring a license for such exports while also ensuring its national security, Gary Locke said, the former US commerce secretary, who took the new post in August. At the same time, it is necessary to make it easier for Chinese business people and tourists to get visas to travel to the US for business and leisure, he said. Obama has also set a target to double US exports by 2015. A recent US-China Business Council Inc (USCBC) report said that US exports to China grew four times faster in the past decade than its exports to the rest of the world. The overall growth of US exports to China hit 468 percent from 2000 to 2010, averaging 19 percent a year. Over the next year, Locke said and he will lead five trade and investment missions to emerging Chinese cities and will focus on high-growth industries such as clean renewable energies, rail, aviation and the information and communication sectors. Goals such as expanding domestic consumption and fostering innovation require an acceleration and expansion of the economic reforms China has undertaken in the last few decades, he said.